Twitter is one of the best and largest social media network in terms of job hunting online. With its immense connection and interaction power, this social networking site gives you a great chance to find and land a perfect job. 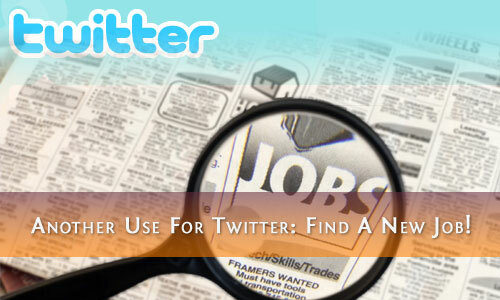 Here are few tips and tricks on how to use Twitter as a job hunting tool. Most of the time, people inside or connected the company do always tweet about their job hiring even before it hits online job sites or advertise it in printed materials. With you knowing the hiring the earliest, you got a chance to be the first one to submit your resume and probably get hired for the job. Even if you don't know the person, twitter gives you the power to follow him/her out, so why not take advantage of this and wait for them (or ask/mention them) to tweet about it. Optimize Your Profile Twitter allows your to introduce yourself in few words via your profile. Use this space to highlight your skills and expertise that a prospect employer may look at. Make this space as your selling point that highlights your skills. Need A Job? Tweet About It! For sure, it wont hurt your pride or ego to let your twitter followers know that you need a job desperately! I might be exaggerating there but yes, tweeting about you needing a job and asking for help is a great way to get a serious job. You never know if one of your follower's relatives or friends knows a job hiring that suits your skills. Besides, there is no harm in asking right? Check The Trending Topics This one might be a bit connected or similar with the tip above. If you wanna extend more your job hunting act, then ride with the trending topics. First and foremost, be sure to check what is trending locally or at your country. If you are living in the Philippines, then it's best to choose Philippines as your trending topic settings to further take advantage of this method. Following the tip above, you only have to add a trending topic word or hashtag that suits or compatible with your job hunting tweet. For example, you tweeted "I am in need of a job related to video games", and one of the trending topic is "video game tester jobs", then you may add the words "video game tester jobs" next to your original tweet. This tweet of yours will not only be seen by your followers, but by all people who follows the trending topic "video game tester jobs" as well. Who knows, a possible employer might be watching that topic. Using Hashtags (#) are a possible engaging tactic with your job hunting tweet as well. Along with your original tweet (using the example above), adding something like #jobneeded #ineedajob can work wonders for you. Just like the trending topic, this kind of tweet can be seen by lots of people who watch and follow that hashtag religiously and a possible employer might be watching this topic. Use Twitter Job Hunting Search Engines You may also want to use job hunting search engines made specifically for twitter tweets. Here are some of the best job search engine for Twitter that lots of companies and employers are now using to post and advertise their job hiring. I hope the above tips works for you. I know that they are kind of basic but I am quite sure, it can help you. Always remember that everything you tweet will be you and yourself. So if you are using your twitter profile in your job hunting, you might double check and triple think those thoughts you wanted to tweet. It's best to tweet positive things to get positive vibes and in the end, positive score from your soon-to-be employer who might hire you because of your profile in Twitter and the tweets you shared or posted. Ron Leyba is a proud Filipino blogger. Visit his blog post about video game testing jobs online. Great tips. They are surely useful. In my opinion though you should look at all options there are- part-time online jobs, online businesses - ebay, amazon etc. On a related item, it's important that we watch what we put on our social media profiles (e.g twitter, fb, etc) as potential employers may be able to do background checks online. Thank you for these awesome tips. It is so hard to find a job these days and a social network like twitter could be of help. This is really helpful for those who are active on social media as twitter, and for sure one will find a job as well...thanks for the input! what a timely tip. I have a friend who is looking for job, i have to refer her to your site then. Very useful tip to those in job hunting! Never really thought of Twitter use in this way until now when I read your post. Good tips! Awesome Tips! Thanks for sharing this! Pls. accept my apology for not able to continue to comment to all the blogs on excom Sept. 3. Ngayon ko lang nalaman after a blogger friend told me through FB. I remember I posted lunch time and then I was not able to go back online and continue my responsibility for an errand…then forgot it totally. I read some bad comments already for the past days..honestly, I never thought ako pala ang target…wahahahahaha… I deserved it. Anyway..will you forgive me dear? Actually I've seen quite a lot of job ads on Twitter. My former boss built his own homebased company and he was hiring a few employees on Twitter and interviewing them on Skype.